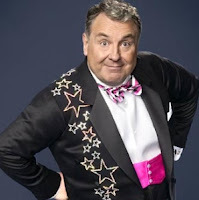 Russell has just been talking to Alan Titchmarsh on ITV1 and has said he turned down the role three times because he was daunted by the idea and unsure whether he could do it or not. Andrew Lloyd Webber telephoned him to ask what was needed to persuade him. Russell explained he couldn't follow in Michael Crawford's footsteps per se and needed to make the role his own by adding some dancing. So courtesy of the Lord changing some numbers and Arlene Phillips new choreography there is now some Charleston, American Smooth and a Paso Doble in the show.